Villa near Civitella in Val di Chiana, Arezzo, Tuscany, Italy - Beautiful And Tranquil Location With Panoramic Views. Now also featured on Alistair Sawday's 'Special Places to Stay' If you are looking for a secluded property with beautiful views, yet close to many of the attractions of Tuscany, this could be for you. 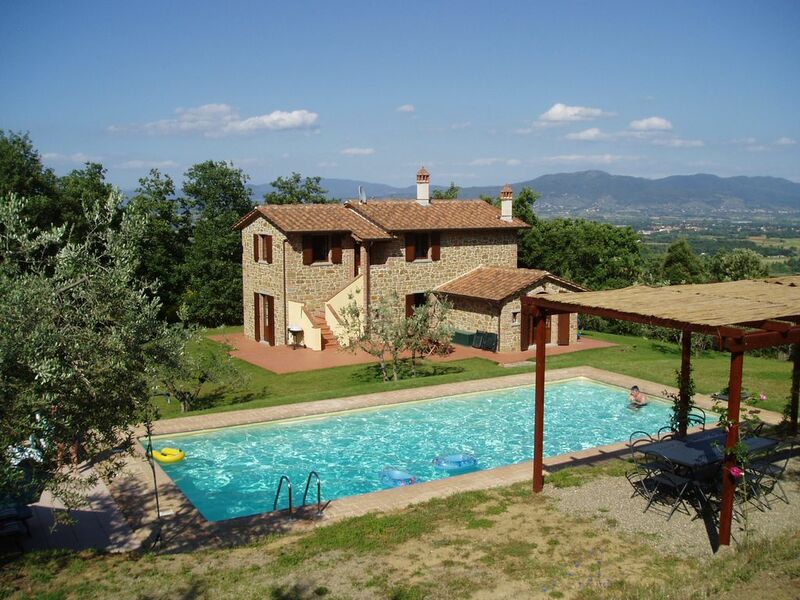 On a tranquil Tuscan hilltop, a comfortable farmhouse/villa with a large pool. Wander acres of olive groves, dine al fresco beneath starry skies. Elevated above the Chiana valley this is a peaceful Tuscan farmhouse surrounded by acres of olive groves. The old building had been left to ruin, but a careful restoration transformed its fortunes; a new stone facade, terracotta floors and beamed ceilings blend tradition with solid modern comfort. Through the wooden arched doors interiors are cosy and rustic. Plump sofas surround an open fire, while checked curtains add a touch of English country style. A long pine table is great for sociable dinners in the kitchen, or you can eat al fresco beneath the pergola or impressively starry skies. Good sized bedrooms are simple and fresh; most have garden views and one has an en-suite shower room. A terracotta terrace with a barbecue and outdoor seats frame the house, and there's a gorgeous swimming pool just beyond. Walks from the door head through olives, chestnut and oak woods where you might spot wild boar, foxes and porcupines. The house is in beautiful countryside close to the historic village of Civitella and superbly located for art and culture and all the historic towns and villages of Tuscany and Umbria. Florence is about 1 hour away, Siena and Cortona about 50 minutes, whilst Perugia and Assisi are within easy reach. The pool is normally open and heated from mid-May, however it can be made available earlier on request. Until mid-May there will however be a charge to cover the cost of electricity for heating the pool. David Evans and his wife Edwina bought this property in spring 2006. Whilst our home remains near Winchester in the South of England we have spent many happy times at La Tartaruga, and it is very much our second home. We have three grown up daughters who live and work in London, but who love coming to Tuscany with their young families. We first came to Tuscany when our children were young and loved the area with its old hill towns and glorious landscapes. When we started looking in 2005 we decided that this area was very well placed for all the attractions of Tuscany and Umbria, and Arezzo itself is a delightful local town. When we first saw the house it was obvious that this was the house for us. A huge reconstruction from a ruined farmhouse was almost complete, so there would be very little for us to do, and the views were stunning. We also loved its quiet location which is completely private, although it is close to Civitella and Monte San Savino for shopping and restaurants. There are so many towns within an hour's drive, including Siena and Florence which we never tire of visiting. Often when we go to Italy we like to do nothing more than relax in the sunshine and use the pool. We love to walk up into Civitella and have a drink in the square enjoying the lovely views, and then maybe go for a meal in of the restaurants there, or sit outside for a pizza or pasta in the square with great views over the valley? Florence is an easy trip by car or train. Another favourite is Arezzo where, after a little shopping, or a visit to the wonderful Piero della Francesca frescoes, we like to sit at one of the bars in the beautiful piazza with a beer or aperitif and watch the world go by. Our children also love coming to the house with husbands and friends and we often have a houseful which is great fun. We find La Tartaruga a very special place. En-suite bathroom to bedroom 1 with shower, washbasin, toilet and bidet. Bathroom 2 with shower, washbasin, toilet and bidet. Bathroom 3 with shower, washbasin and toilet and washing machine. There is free wifi by satellite. Hand and bath towels are provided together with separate towels in each bathroom and the kitchen and tea towels. Swimming towels are available on request. Large kitchen/dining room with French doors onto the terrace and dining table seating 10. This leads into sitting room with tables, armchair and three sofas. Wi-fi, Radio, TV and DVD player. Fireplace. Large fridge with separate freezer section above. Two large cafetieres and one small espresso maker. Full selection of crockery, glasses and cutlery together with usual cooking utensils, pots pans etc. 4 ring gas hob and electric oven and grill, microwave, dishwasher and fridge/freezer. The dining area is situated within the kitchen. See photographs and floor plan. The satellite connection provides British television with a catch-up facility. There is a substantial collection of books. There are jigsaws, scrabble, chess, uno, dominoes, playing cards, and other games. There is a large area of cultivated garden and lawn round the house with a pergola and table and chairs (for 8) on the terrace overlooking the pool. Bicycles are available for hire in Monte San Savino. There is a large terrace outside and round the house, with a large outdoor table and chairs, ideal for meals alfresco. Described by one American writer as 'Among the 50 most beautiful courses of the world' Circolo Golf Ugolino is about 55 minutes away just south-west of Florence. For further information visit the owners' own website. As can be seen from the photographs of the property the access is suitable for wheelchairs and there is a downstairs bedroom and separate shower room. The large heated pool (12 x 5+ metres) is exclusively for use by guests, and is not overlooked by any other house. Please note from April to mid-October and over Easter lettings are Saturday to Saturday. Cancellation policy as owners' standard agreement Central heating. No smoking or pets allowed at the property. Outside: Large terrace with table and chairs for 8 and umbrella. Barbecue. On the olive terraces there is a pergola to give further shade which overlooks the pool and is furnished with a table and 8 chairs. There are 11 sunloungers with cushions. The terraced olive grove and grounds of about 7 acres provide for a pleasant after dinner stroll. The swimming pool is private and measures 12 metres by 5.2 metres. Cleaning / Towels / Linen / Maid service: Bedlinen and towels are included and changed every Saturday. Please note that guests the bath towels are not to be taken from the house, but guests can either bring their own swimming towels or these can be provided. Other: Spacious entrance hall. Water from private bore-hole. Civitella is more or less equidistant from the east and west coasts of Italy. The west coast can be reached by car in under 2 hours, the east coast in under two and a half hours. Low cost airlines fly in to Pisa, Rome, Bologna and Perugia. BA flies in to Pisa, Rome and Bologna. Meridiana and Cityjet (from London City) fly in to Florence which is about 1 hour away. There other options. By car the house is a bit less than 950 miles from Calais. Maybe consider driving via Brussels, Luxembourg, Alsace and the St Gotthard tunnel - virtually no road tolls and cheap fuel in Luxembourg! The hilltop village of Civitella is about 2 miles away with a bar, two nice restaurants and a pizzeria, with great views from the piazza. Arezzo (20 minutes) has lovely medieval streets and a well known monthly antiques market. The property is ideally situated both for Cortona (50 minutes) and Perugia and Assisi to the east, as well as for Siena (50 minutes) which is a real delight and the incomparable Florence (1 hour). Florence and Pisa are easily reached by train from Arezzo or Montevarchi. So many of Tuscany's most famous and beautiful places are within one hour of the house. Florence, Siena, the hills and villages of Chianti, Arezzo, Cortona, Perugia, Montepulciano and the Casentino, whilst Orvieto and Assisi are only 15 minutes further on and an easy drive. Arezzo is a lovely town in its own right. It has fantastic frescoes by Piero della Francesca and other fine art works. After a hard morning of culture relax in the Piazza Grande with a coffee or beer. There are also beaches and watersports on Lake Trasimeno. Shops and other local facilities: Civitella - one general store (2 miles). Albergo - one general store, bar and pizzeria (2 miles). Badia al Pino - mini-market (3+ miles). Monte San Savino - most facilities (8 miles). Arezzo - all facilities (10 miles). We do most of our shopping in the supermarket in Monte San Savino, where there are also a family run food store and two excellent butchers. On Wednesdays there is a local market. Mountain bikes can be hired from Monte San Savino, and there are riding stables at the bottom of the hill. There is a small vineyard also at the bottom of the hill which supplies wines at very reasonable prices which are better in quality that similarly priced supermarket wines. Guests will find in the house a list of around twenty recommended restaurants and there are many more to try. Nearest are the pizzeria in Albergo and the two restaurants in Civitella. The restaurants and pizza places range from fine dining to a brilliant pizzeria at the bottom of our hill - best to book on Friday and Saturday. Booking Notes: The house is open all year for weekly rentals with a Saturday changeover., except during Easter. The pool will normally be open mid-May to early October (outside these dates by arrangement) but the season can be extended on request. Provisional bookings will be held for 7 days after sending to you a rental contract. Security deposit required. All payments can be made either via PayPal or direct to our bank account. Please ring the owners for further information. Changeover Day: Changeover day is Saturday and guests depart by 10 am. Arrival after 4pm. Over Christmas, New Year and Easter the letting periods can be flexible. Outside the summer months lettings are for a minimum of 4 days. Notes on prices: Prices are inclusive of final cleaning.